Are you ready to jump back into the trenches and deal with the day-to-day battles that sometimes go along with homeschooling? Ready or not, The Old Schoolhouse® is here to help you ease back into your routine. As you sweep up those last bits of Christmas tinsel and store those holiday decorations, take time to read the beautiful January issue of TOS Magazine to discover fresh teaching ideas and learn about the tools you need to educate your children successfully. 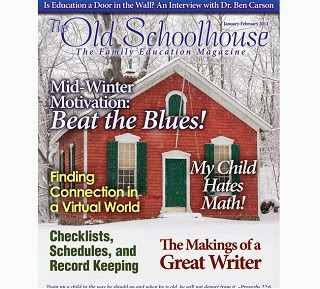 Digital editions of the Old Schoolhouse Magazine are available for download the first of each month. They are free to access and may be downloaded to your computer, laptop, or mobile devices.